William Goldbloom is a skilled investigator and trainer, with an eye for detail and nuance even during high-stakes, high-pressure investigations. A natural people-person, he is an adept explorer of workplace cultures, and enjoys helping individuals understand and overcome conflict. William sees fairness, empathy, and respect for all parties as critical to his work as an investigator and trainer. At Rubin Thomlinson, William develops and delivers training sessions that educate clients about their legal obligations in the workplace. William also conducts workplace assessments and investigations to help employers prevent, address and resolve issues related to discrimination, physical, verbal and psychological harassment, violence, poisoned environments and bullying. 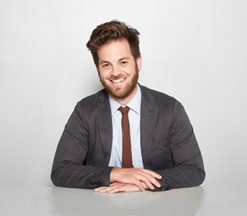 Prior to his work at Rubin Thomlinson, William cultivated his interest in the legal effects of workplace dynamics as an employment and labour lawyer at a large international law firm in Toronto. While there, he gained advocacy experience in labour arbitration, wrongful dismissals, disability benefits-related claims and human rights complaints. He was also involved in reviewing employment agreements, drafting workplace policies and conducting workplace investigations. William has also volunteered with Pro Bono Students Canada, worked as a student advocate in the criminal law division of Downtown Legal Services, and represented low-income clients before the Ontario Court of Justice.